Sure, feeding corn is technically supplemental feeding, but it’s not the best option when deer nutrition is concerned. Long gone are the days of waiting until late November before heading into the woods to hunt deer. Today, deer hunting has become a 365-day-a-year religion. With trail-camera technology sending pictures to our smart phones the minute they are taken, hunters are monitoring deer year-round. Technology has also crept into the world of deer nutrition, too. It used to be, the only guys planting summer food plots for deer were farmers, and they weren’t planting for the deer, but instead to harvest a crop. Nowadays, hunters are spending lots of money to plant soybeans and many other high-protein foods for their deer herds to ensure they are getting proper nutrition year-round. However, there are some that don’t have the land or equipment to plant big summer food plots, or they live in an arid section of country where planting would be a waste of time and money. 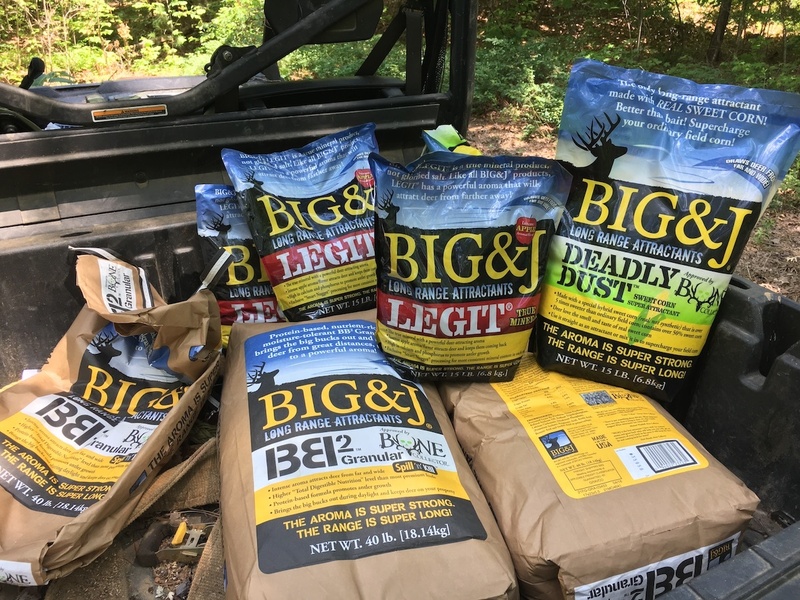 There are also other hunters who choose to add supplements on top of planting large summer food plots — giving deer every ounce of needed nutrition to grow those big racks. Let’s take a look at what types of nutrition deer need and at what time of year. Winter: During the winter, deer are seeking out energy foods, such as acorns, corn, food-plot grasses, etc. During the rut, a buck will burn through his fat reserves because eating is not the top priority on his mind. However, procreating is. After the rut, a buck will once again focus on high-energy foods to keep warm during the winter. He’ll also need protein foods to help replenish muscle mass that he loss during the rut. This is a prime time for supplemental feeding. However, all protein is not created equal. For deer, the type of protein is very important, and the feedstuffs used for protein supplementation need to be evaluated based on the amount of degradable protein (DP) and undegradable protein (UP). Degradable protein is protein that is produced by the animal from digestion of the bacteria in the rumen and typically is not of a concern when discussing protein requirements for ruminant animals as long as energy is not limiting. Undegradable protein is true protein provided to the animal from feed/supplement that passes through the rumen to the small intestine unaltered. Crude protein is a combination of both DP and UP and is a common measure shown on feed labels. Crude protein is measured by the nitrogen content of the feedstuff and does not describe if the protein is DP or UP therefore it is important to be informed of the protein composition (DP or UP). In conclusion the type of protein needs to be considered when making decisions on how to manage food plots, feeds and attractants to supplement deer herds. Both DP and UP requirements of deer herds need to be met to maximize genetic potential. Spring: During the spring months, bucks will begin re-growing antlers and replenishing body mass. The quicker he can build back his body, the quicker his body will put more nutrition towards non-survival functions such as antler development. A buck’s body will always tend to the needs of its health and designate nutrients towards its body before giving it to antlers. That’s why mature bucks grow the biggest antlers, because their bodies are fully developed allowing the excess nutrients go to antlers instead of the skeletal system or building muscle. Pregnant does are in need of protein and minerals during this time of year, too. They are now developing a fawn or fawns and they need lots of nutritious food to not only maintain their bodies, but the newly developing fawns as well. Summer: Bucks are in full on antler development mode and in need of lots of protein and minerals to grow the largest racks genetically possible. Does are in major need of protein and minerals as they are producing milk for young fawns. Having plenty of these nutrients out on your hunting property now is crucial for both bucks and fawns to reach their potential. Fall: Yeah, it’s hunting time again! It’s also time for deer to start seeking out those high-energy foods again. They are also seeking out foods high in fats such as acorns. Protein no longer has the drawn it did in summer as deer are gearing up for the rut and cold months again. So, What Do You Feed Them? These bucks cruised into the feeder every night and sometimes during the daylight hours to feed on Big and J BB2 supplemental feed. Last summer and winter I used a number of products from a company called Big and J. They take deer nutrition to another level. They make a number of products that are designed for year-round feeding of your herd to ensure all the nutritional gaps are being filled. We’ve only fed corn in the past, so when I first started feeding Big and J BB2 granular, I mixed it at a 1:1 ratio with corn to get the deer used to it. Then, over the course of the next couple of weeks I phased the corn out completely and the deer were mowing it down. Here’s a rundown of the products offered and how and when they should be utilized in your game management plan. Big and J BB2 supplemental feed is scientifically formulated to fill in a whitetail's nutritional requirements on a year-round basis. BB2 granular and cube – Aside from the value as an attractant BB2 is over 90 percent digestible which is greater than corn. In addition, the energy comes primarily from digestible fiber and fat instead of starch and fermentable carbohydrate. This leads to a near zero chance of acidosis or digestive upset, which is possible with corn. The protein content of BB2 is guaranteed to be 18 percent as a minimum and is comprised of approximately 70-percent UP and 30-percent DP. Undegradable protein is more than likely a limiting factor when considering feedstuff availability vs. requirements of deer. Remember not all protein is created equal and deer have adequate degradable protein supply from what they are grazing on. The mineral content of BB2 is not enough to meet the needs from a calcium standpoint but does include approximately 1-percent calcium, and would meet all of the phosphorous needs, which are essential components for healthy antler growth. Additional mineral supplementation is needed to maximize genetic potentials for antler development. When to feed? BB2 is the ideal food source for year-round feeding to fill any nutritional gaps in your deer herd. BB2 Enhanced – On the surface BB2 Enhanced is the same as BB2 but Enhanced includes protected amino acids (amino acids are the building blocks of protein). Protected amino acids are scientifically proven to make it through to the absorption sites for maximum biological potential. In addition, Enhanced is fortified with organic sources of Zinc, Copper, Magnesium, and Manganese which have greater bioavailability than standard sources. Legit – Legit is the product designed to meet the mineral needs of your deer herd which aid with antler growth and milk production in lactating does. It’s a great source of calcium and phosphorous for bone/antler growth. Legit would meet the mineral deficiency in the natural habitat. Includes trace minerals that are essential to reproductive function and healthy bone growth/antler growth. It’s apple flavored for attracting power. When to feed? Late winter through summer. Once you begin looking at deer nutrition at the scientific level, you can see there is a lot to learn. It would be hard to put all of the needed elements on your property to ensure all nutritional gaps are being filled. However, with companies like Big and J providing the science and nutrition in easy-to-use products, it does make supplemental feeding more efficient and successful. Google Big and J products to learn more and to find local dealers that carry their supplemental feeds.